Yesterday I wrote about Google's announcement of their upcoming Chrome OS, a "browser running on bare metal" that will just be used for web apps. I predicted (like many others) that as web apps evolve into true rich internet apps that can run locally, leverage rich 3D graphics, and work offline, they'll slowly replace Windows apps as the de facto "desktop" apps. I also pointed out that even when we hit the point where most (or all?) new apps are these new-age rich web apps, we'll still have a lot of legacy apps to deal with. I mean sure, web apps will be able to replace the simpler Windows apps like image editing and office productivity and stuff, but there are a lot of complex Windows apps with millions of lines of code that aren't going anywhere anytime soon. And it's that future where terminal server / XenApp / remote Microsoft Windows apps will really shine. Remember the Terminal Server of 2000? Back in the late nineties & early aughts, Terminal Server's sweet spot was delivering seamless Windows apps to full desktops. (Sure, there were lots of thin clients out there accessing MetaFrame-based full Terminal Server desktops, but those were the minority. Terminal Server's rule up through just recently was as an app server.) This worked well and Terminal Server proudly filled that niche to the tune of almost 100m users worldwide. But then something happened and we got all hopped up on VDI. VMware started talking up the benefits of VDI and downplayed Terminal Server (even though VDI & TS are both just alternate forms of datacenter-hosted desktops and share about 90% of the same benefits & disadvantages). 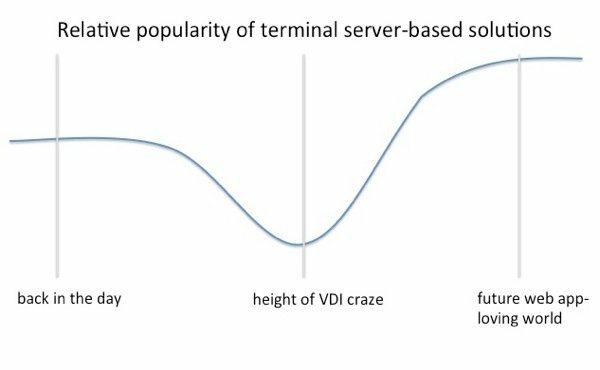 So while I personally still feel there are many great use cases for Terminal Server today, it's almost like we're forgetting about it in the VDI / desktop virtualization hyper bubble. Everyone is all about how desktops can be dynamically assembled and delivered, and Terminal Server feels like yesterday's news. Let's face it: Even though we know Terminal Server has a place today, in the world of desktop virtualization Terminal Server is an old afterthought with all the sexiness of a floppy disk. In fact many companies are doing away with their Terminal Server environments altogether, deciding that it's easier to deliver VDI-based desktops for their central desktop needs since they then only have to support a single OS platform. But all is not lost! If the browser-based OSes and cool web apps we discussed yesterday catch on, then Terminal Server (and by extension Citrix XenApp, Quest vWorkspace, etc.) will actually become more popular than ever! Why? Because in today's world we don't need Terminal Server as much since most of us run Windows locally. But once we move away from Windows on our clients, then terminal server will be our lifeline to the Windows apps that we'll need for the next ten years until all the apps move off Windows. So don't throw away all those old terminal server books yet! By 2020, all Windows will be terminal server! Am I the only person who still uses RDS in lieu of VDI for their primary desktop environment? I agree Brian, in our quest to keep a single master image for entire XenDesktop deployment, RDP RemoteApp/XenApp is proving invaluable. Haven't run across anything that doesn't work nicely as a virtualized app, so we have or 3 or 4 major business apps built into the master image and the other stragglers are all virtualized and accessible on a per-user, as-needed basis. VDI is the natural expression of the IT crowd's frustration with Terminal Server's shortcomings and those of the Dictator of Redmond. It will pass once Microsoft realizes that Containers is the natural evolution of RDS, and therefore the best compromise between today's two extremes, none of which capable of delivering any sustainable ROI. Why not try a simple flat line instead of the Bell curve? RDS has always been tactical in a Windows-dominated world of desktops, and it shall remain so throughout its course of evolution. The next chapter in the Windows saga in not necessarily Windows 8, 9 or 10. It's Azure. With respect to Azure, RDS and VDI will be the equivalent of the16-bit MS-DOS subsystem. In order for this to become a reality, Microsoft must stay constant with their lack of innovation, and being stuck on the improving the same operating system mentality. However, the only thing that would really save them is if they wrote a new shell from scratch, and then wrote another shell to support all the windows apps we have today on the new shell (NOT MED-V!). Now we're back full circle to the scenarios Brian has laid out over the last few days. Guess it's too late for Microsoft...this strategy is here to stay. On one level, I agree with your premise here, Brian. On the flip side, when I first got my iPad I was obsessed with finding the best remote display client (like many of your readers, I'm sure) to see if it would be possible to "get by" in certain circumstances with just the iPad. What I have found is that I now have a folder loaded up with Citrix Receiver, Wyse PocketCloud, RealVNC, Splashtop Remote, etc.. and I rarely open it. While I still spend most of my working hours in a full Windows 7 VM, native iPad apps with some stitching like Dropbox and GoodReader have me at a point where I can spend a whole day (or even a couple) out at an event or traveling and pretty much accomplish everything I need to with just an iPad. I don't use Gmail and Google Apps much, but I suspect that there is a sizable population that is in the same place with that stuff. Terminal services is definitely strategic where this is all headed, but will it really be "huge" or will it just be fill the same niche it does today while serving as a temporary safety blanket for the majority of us until we realize that we can be quite productive (perhaps more productive) most days with less horsepower and different apps than we've always used in the past. And when we do need more horsepower, how many of us are really doing things that lend themselves to terminal services versus things like video editing, design, compiling code, etc.? In my opinion, the future is a cheap and zippy workstation with an SSD at the desk you do most of your work at and an iPad or Google Android / ChromeOS device with remote display back to that primary workstation for when you are out and about. I'm pretty new to this being that I'm a lone IT admin working for a SMB. Never have implemented TS or any VM tech as of yet. I discovered this site yesterday and it looks to be a good resource for me to learn what I want to know. That said, Caillin Peacock wrote: "Am I the only person who still uses RDS in lieu of VDI for their primary desktop environment?" By RDS I'll assume for now that you are referring to Remote Desktop Services. If this is so, I find this interesting over on microsoft.com. Accelerate and extend desktop and application deployments from the data center to any device with Remote Desktop Services (RDS), one of the core virtualization technologies available in Windows Server 2008 R2. In addition to the traditional session virtualization scenario (formerly known as âTerminal Servicesâ), Remote Desktop Services has expanded its role to provide an extensible platform for a Virtual Desktop Infrastructure (VDI). So a quick understanding of this space as I see it is that if RemoteFX can be run an any "remote" hardware device, one can deliver full Win7 features virtually and remotely. Is that about right. For a MS centric org like ours, I would no longer need to bother myself at looking at the likes of ChromeOS, etc. Comments? I agree with the last line "All windows will be Terminal Server".... There will be just less of them in 2020. In 2020 we'll still be talking about TS/XA delivering niche legacy apps......just like we were 10 years ago. The challenge for MSFT will be to ensure that the industry doesn't define "legacy app = windows app". I know I wanna be clicking the "Mail" icon on an iPad rather than opening the Ctx Receiver !!! I'm glad you brought up the point about Terminal Server being forgotten. Sometimes in IT we get into these "what's hot lately" crazes, where we forget about everything else and try to apply the latest trends to every situation. The fact is that Terminal Server has advantages over VDI, while VDI also has advantages over Terminal Server. That's why most organizations are best served by adopting a hybrid approach, with an optimal mix of Terminal Server (for task-oriented users), VDI (for power users), and Blade PCs (stock traders, graphic designers, etc.) which delivers the most benefit and platform flexibility to the organization. Ericom Software's PowerTerm WebConnect facilitates this hybrid approach by managing access to Terminal Server, VDI and Blade PCs, all with one management tool, one product.